Neurodegeneration (NDG) is linked with the progressive loss of neural function with intellectual and/or motor impairment. Several diseases affecting older individuals, including Alzheimer's disease, Amyotrophic Lateral Sclerosis, Huntington’s disease, Parkinson's disease, stroke, Multiple Sclerosis and many others, are the most relevant disorders associated with NDG. Since other pathologies such as refractory epilepsy, brain infections, or hereditary diseases such as “neurodegeneration with brain iron accumulation”, also lead to chronic brain inflammation with loss of neural cells, NDG can be said to affect all ages. Owing to an energy and/or oxygen supply imbalance, different signaling mechanisms including MAPK/PI3K-Akt signaling pathways, glutamatergic synapse formation, and/or translocation of phosphatidylserine, might activate some central executing mechanism common to all these pathologies and also related to oxidative stress. Hypoxia inducible factor 1-α (HIF-1α) plays a twofold role through gene activation, in the sense that this factor has to “choose” whether to protect or to kill the affected cells. Most of the afore-mentioned processes follow a protracted course and are accompanied by progressive iron accumulation in the brain. 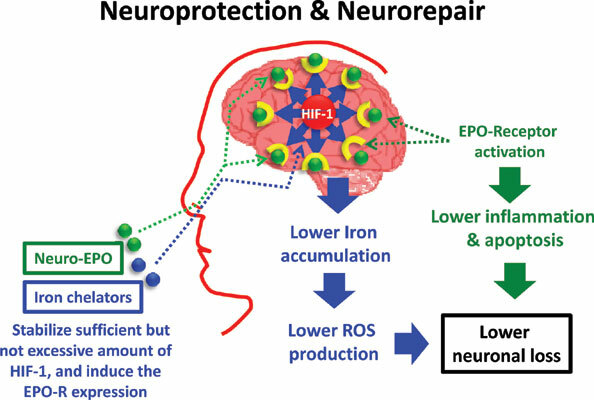 We hypothesize that the neuroprotective effects of iron chelators are acting against the generation of free radicals derived from iron, and also induce sufficient -but not excessive- activation of HIF-1α, so that only the hypoxia-rescue genes will be activated. In this regard, the expression of the erythropoietin receptor in hypoxic/inflammatory neurons could be the cellular “sign” to act upon by the nasal administration of pharmacological doses of Neuro-EPO, inducing not only neuroprotection, but eventually, neurorepair as well. Neurodegeneration, HIF-1, MDR-1, refractory epilepsy, Neuro-EPO, neuroprotection.